Eigen has found a niche among the most reputed metal stamping manufacturers and suppliers in the market. 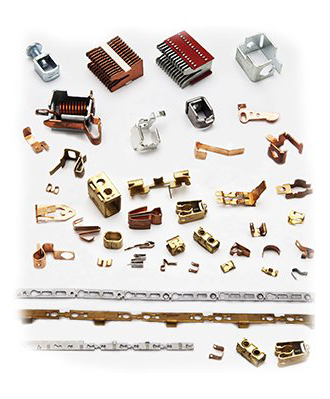 The company uses latest technology for their various projects, and is proud to have a reputation for being the premier precision metal stamping company. Over the years, Eigen has always worked diligently to stick close to their commitment of being a partner in customer’s growth, developing various processes, removing procurement burdens off customer’s shoulders and lowering operational costs. Specializes in stamping tight-tolerance, high precision and close pitch parts. These tasks are handled with the help of highly developed automated processes. Stamping is done for both ferrous and non-ferrous materials with thickness even lower than 0.002″/0.05 mm, and can go as high as 0.19″/ 5mm to even higher. This helps serve a wide range of clients with varying stamping needs. The company has an amazing production capacity of over 500 million components per annum, and as a result it is able to keep up with the growing needs of many happy customers around the globe. As a metal stamping supplier, it is crucial to be reliable and capable in order to supply all the deliverables at the right time. Eigen knows this for a fact, and has a great track record of being a punctual supplier. The company offers a single point of responsibility for orders and this helps in providing on time deliverables to clients. There are strict timelines for manufacturing as well as supplying, and this keeps customers satisfied with on time delivery. The hard work, efficient planning, strict deadlines and timely deliverables are just some of the reasons why Eigen is known for being a leading precision metal stamping supplier in the global market. Eigen is backed by decades of experience in the development, design, manufacturing and supplying of a wide range of metal stamping tools and components. Eigen offers many services under one umbrella, and this helps provide an optimized supply chain solution to customers. Since the inception of this company, the focus has been towards coming up with precision, being reliable, and aiming for extraordinary outcomes. Eigen works as a partner with the customers in order to clearly understand their requirements and satisfy them. Once the requirements are clear, it becomes possible to provide optimum value solutions to strengthen the partnership. The quality of being innovative, creative, adaptable, and looking to constantly learn sets Eigen apart, and makes them the preferred choice for metal stamping manufacturing and supplying needs. Eigen is located in Bangalore; the technology capital of India. This is a strategic location as the company has quick and easy access to ports, a good network with the well-established vendors in and around the country, and the best tool making expertise. This location is perfect for getting all the work done on time and delivering it to the clients. Communication is one of the most important things in the efficient functioning of a business, and the strategic location of Eigen helps it reach and deliver quality products around the globe. Apart from providing good services, the company needs to be reliable so that customers can depend on them. Eigen has a proven track record with multitudes of customers from Europe and USA for being reliable, and servicing the complex requirements of industries like aerospace, electronics, locomotives, and more. The company is providing excellent services to their partners since many years and this reflects on the reliability and punctuality in delivery services. Precision in a particular service can only be accomplished by professional expertise, and this is true with Eigen as well. Apart from using the latest technology in precision metal stamping, the company is backed up by highly skilled and experienced professionals. The professionals working with Eigen have made it possible to design, develop and manufacture even the most complex press tools with 45 different stages. This is definitely a feat that is hard to reach without professional expertise. The excellent reputation and a highly versatile profile of Eigen proves that is it one of the best precision metal stamping manufacturers and suppliers. Another crucial aspect that supports this statement is the trust placed by high profile brands such as ABB, Larsen & Toubro, Siemens, and other big names in the industry on a constant basis. Even though Eigen is experiencing a lot of success in the metal stamping market, the company is ever ready and equipped to take on new projects and servicing multitudes of customers across the globe.